Direct from the factory in Germany, the Rose II Greenhouse can be summed up in two words – heavy duty. Its heavy-duty aluminum frame combined with 10 mm twin-walled polycarbonate glazing gives it extra strength and superior insulation (R-value: 1.9). Besides being strong, the Rose II Greenhouse has a heavy-duty Dutch barn door, an over-sized rear wall window with an automatic opener for extra ventilation. 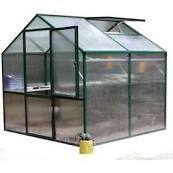 This is one of our strongest and longest lasting greenhouses.